Cajun Dinner Special: Stay 2 nights at Crawfish Haven/Mrs. 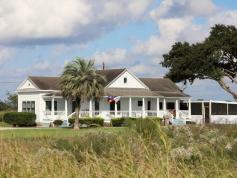 Rose’s Bed and Breakfast and enjoy a memorable Cajun meal for two prepared by the owner, Barry Toups, who is well-known in the area for his cooking skills. Price dependent upon choice of room and type of meal prepared. Please ask for the “Cajun Dinner Special” when calling. 337-652-8870. This Special is not available to be booked online.